A huge percentage of progress at school is accomplished visually. But even with this overt correlation between eyesight and learning, many parents don’t realize how profoundly vision problems affect education, and don’t include eye exams as part of their child’s back to school health check-up. 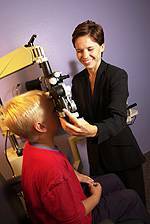 It’s important to know that because vision in children changes, regular eye care is central to success at school. School-aged children possess an amazing ability to work with an issue with their sight and they might not talk about their difficulty, as they themselves do not know they don’t see the world the same way their peers do. It is extra important to look out for the signs of vision problems as your child progresses in school. Telltale signs may include confusing numbers or letters, watery eyes and frequent eye rubbing, extra close reading distance, head tilting, and avoiding detailed work. Not being able to meet the visual requirements at school may potentially affect his/her performance. New educational technology, like interactive whiteboards, can sometimes exaggerate subtle but significant vision problems. Without adequate vision, students may suffer not only in the classroom, but also mentally, physically and emotionally. If you’re the parent of a child who wears glasses already, now is a perfect time to reassess the suitability of his or her current frames and maybe purchase new glasses for your child for the new school year. If children don’t feel good in their glasses, they probably won’t wear them much. Find a good time to stop by to see us when you’re getting your kids all ready for their year. We’ll help your child start the new school year with their vision in check.